SNOEL'S BLOG: Kea out of control!!! No blogs for a while now... Sorry must get back into it. 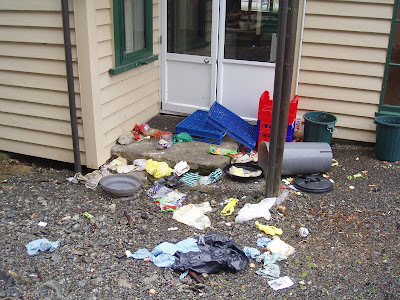 So here is a photo from out the back of the lodge of Kea(Alpine parot) Damage. The birds have no problems eating through the plastic and are very smart, so no problems undoing the clip on lids of the bins. I took this photo to make a sign telling my groups not to leave their rubbish out the backdoor- I think it will work! I had a couple of really fantasic family surprises this week. Firstly my dad sent me his memoirs which he recently published. They are a fantastic read and really well put together, so well done dad! And phew! no major revelations like... I prefer to wear womens clothes or have another family on the otherside of town. No, actually just pretty normal everyday guy stuff - So well done dad. My dad is pretty awesome actually. And the other thing was the kids rang on Fathers day for the first time ever! I even hear rumours of a card having been created! Thanks kids, can't wait to see you in the holidays!! !